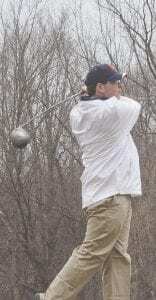 METAMORA – Come rain or shine, many area boys’ high school golf teams will get their first taste of tournament play for the season at the 28th annual Lapeer golf Tune-Up, slated to take place this Friday at Metamora Golf and Country Club. After last season’s relatively dry but cold tournament, the forecast for this Friday’s tournament doesn’t look quite as promising. An over 90 percent chance of morning rain is predicted, according to Monday morning’s forecast, but the temperatures should be at least above 50 degrees. Lapeer boys’ coach Steve Stearns noted the tournament will be postponed to next Wednesday, possibly next Thursday, should weather prevent play. “If it rains, we’re either going to get wet or cancel,” noted Stearns of Friday’s scheduled date. The tournament field is down two teams from last year’s total, but of the 21 teams competing, many are strong programs that will be looking to take home the title – including last season’s champion Utica Eisenhower. Teams slated to compete in the Tune-Up this season include: Carman-Ainsworth, Davison, Fenton, Frankenmuth, Goodrich, Grand Blanc, Holly, Kearsley, Lake Fenton, Lakeland, Lapeer, Macomb Dakota New Lothrop, North Branch, Oxford, Pontiac Notre Dame Prep, Saginaw Heritage, Utica Eisenhower, Utica Ford, Waterford Kettering and Waterford Mott. Of those 21 teams, 17 competed in last season’s event that saw Eisenhower win with a 323. Lapeer finished second with a 326 and Fenton was third with a 343. Grand Blanc, Oxford, Saginaw Heritage, Utica Ford, Goodrich and Waterford Mott also made the top- 10 of the event, leaving Birmingham Seaholm as the only top-10 finisher from last year not returning for this season’s event. When it comes to his team, Stearns is hoping their experience will carry them to another high finish. Though many uncertainties surround the tournament, Stearns noted the only thing he is hoping for right now is good weather – a stranger to the Tune-Up for the last couple of seasons. The Lapeer Tune-Up is slated to begin Friday at 9:30 a.m. at Metamora Golf and Country Club.